Nepal - Where We Work - International - World Education, Inc.
World Education has maintained a continuous presence in Nepal since 1979 with a portfolio of projects that include educational innovations in formal and nonformal education systems in child labor, health, peace building, microfinance and livelihoods, and sustainable agriculture. 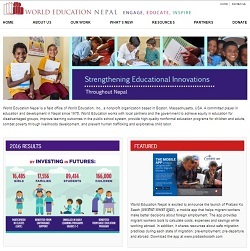 World Education also worked closely with the Nepal Ministry of Education (MoE) on the development of the national nonformal education program that eventually became the national literacy campaign. 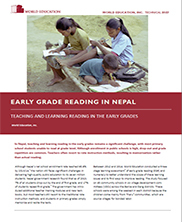 World Education has been central to the integration of messages about health, microfinance, self-employment, and peace building into widely used Nepalese literacy curricula. All World Education programs in Nepal take a holistic approach to addressing the diverse and complex needs of children and youth. By connecting what is taught in- and out-of-school and what skills are necessary for employment, World Education creates training programs and curricula that equip young people with meaningful employment skills that reflect their social, cultural, and economic realities. After the devastating earthquake of April 2015, World Education’s work in Nepal shifted to include immediate relief to heavily-impacted districts, in addition to supporting current project beneficiaries to meet their basic needs. Because of our long experience in the country, World Education was invited to serve on the UN's Education Cluster Response Team to assess damage and develop a long-term rehabilitation plan for schools in Nepal. Read more about World Education’s earthquake relief activities. Given World Education’s longstanding role and many relationships with local groups in Nepal, we raised more than $20,000 for Nepal relief and are still soliciting donations to support earthquake relief and recovery. 100% of all donations go directly to our partners in Nepal. Two years after the earthquake, Nepal still struggles to rebuild, but efforts such as micro-finance are allowing victims, especially Nepali women, to recover. In a NewsDeeply Op-Ed, How Microfinance Helped Nepali Women Recover From the 2015 Earthquake and a Humanosphere Q&A, Nepal's Long Road to Recovery Two Years after the Earthquake, Helen Sherpa, World Education Nepal Country Director, details how micro-finance paved a road for women to regain their livelihoods. 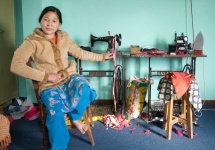 To see our work in action, look at a photo story about World Education's reconstruction work in Nepal and learn about the impact World Education is having on women's lives in the video, Dikchhaya's Dream. 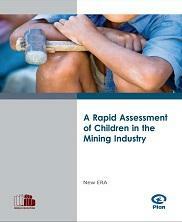 In February 2015, the Guardian highlighted a World Education report into child labor in Nepal's brick industry. Learn more on our World Education Nepal facebook page. Working to reduce non-enrollment, dropout, and repetition rates, to increase the percentage of children who pass program Learning Milestones in grades 3, 5, 8,and 10, and to achieve gender parity. 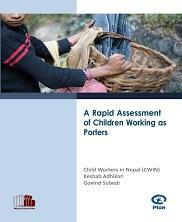 New Path New Steps aims to eradicate child labor in Nepal by providing alternative vocational opportunities; strengthening policy; increasing access to case management; and increasing public knowledge on child labor-related issues. After enrolling in a nonformal education class targeting children who are forced to work in the brick industry, Sharadha was able to transition back to formal school. "I never imagined I'd have a shop of my own," confides Momina Khatun, elated. Born in a family with four other siblings, Laxmi never had the opportunity to go to school.